The casual jeans look is great...love the shoes. I love being short, but everything is too long! The top looks really nice with the skinny jeans. hehe, yes it can be tricky being a shortie sometimes! Your babybump is adorable. Those casual jeans look amazing on you! I thought the skirts would be the best option for pregnancy workwear :) Although I'm surprised just how quickly I'm running out of tops to wear - bump is definitely outgrowing a lot of non-maternity clothing! Loving both looks! The black and white is so chic and the skirt is amazing! 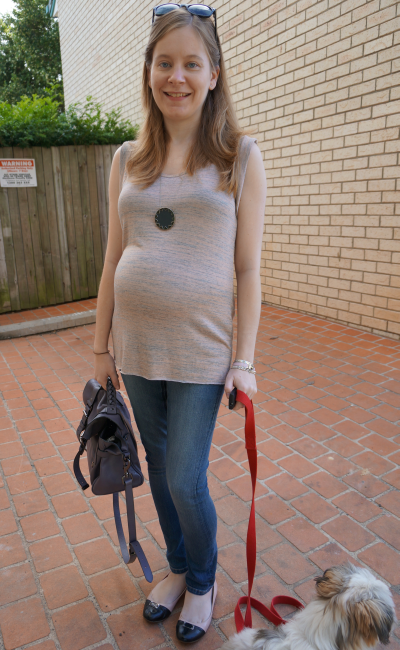 These maternity jeans are one awesome buy! You can probably still wear them after the baby during "redovery" proceeds while you get back in shape :) love the alexa of course! Speaking of RM, I hadn't bought any new RM in ages so I caved lol oops!!! 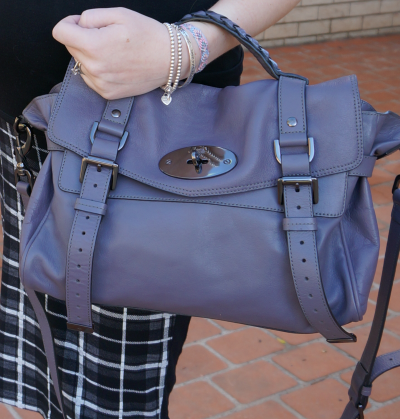 your mulberry bag is so beautiful! loving the color. your oversized tees look SO comfy -- i want one just like them! Super cute looks and your doggy is adorable! I'm always so jealous of your work clothes, they look lovely. You look great in both outfits. I love the print on the skirt, and I love the cool necklace you chose as a finishing touch to your tank and jeans. It's a perfect polished casual look! Your bag is so gorgeous and I always adore that pencil skirt of yours. Your work clothes are always so nice!! I love tees paired with pencil skirts. You look great! I love my rebecca Minkoff bag, except for the snap button. But your Mulberry...yummy!! So pretty and so versatile! You are rocking both the outfits Mica..
You always wear the prettiest skirts which you can wear post pregnancy...and I'm loving that radiance you exude all over!!! They are very adorable! I do have a closeup somewhere on the blog...but would have no idea how to find it to link you to it, sorry! Mica! Thank you for your sweet thoughts. Had the lumpectomy on Friday! Had a chance for sooner, so took it. All went well. NO cancer in nodes! And thanks for your friendly comments and interest view. Fashion item Friday loves you, too, of course. Great having you again. Yay! You are rocking the plaid pencil skirt. And that handbag is nice, too. I love these looks! :) So nice on you! Your bump is too cute! I love how you are rocking it and wearing such pretty maternity clothes. That drape tank looks great on you Mica! 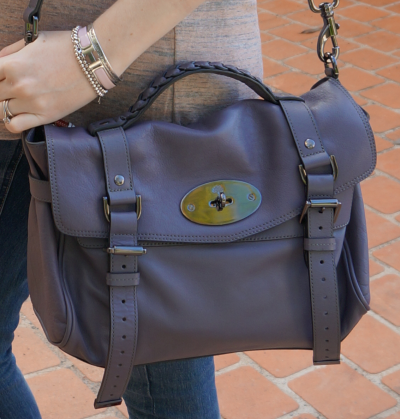 Love that Mulberry Alexa bag! Such a cute bump! Rocking maternity wear! That first outfit with the tartan skirt looks so good. Its great to see how that item has been able to grow with the baby. Love your bags collection. Just wondering how you organize and store all these bags?